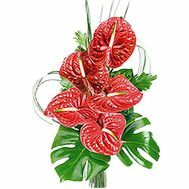 A bouquet of anthurium is a male bouquet, a symbol of strength and masculinity. 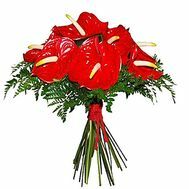 Small or vice versa, a huge bouquet of anthurium attracts attention and rivets all eyes. After all, it's hard to find another such, special, full of symbolism and charm of a man's gift. 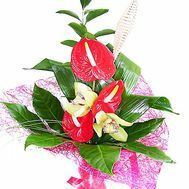 To whom to present a bouquet of anthurium? 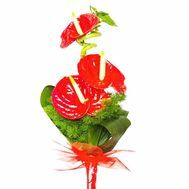 Anthurium is a gift, which is bought mainly for men. And it's not surprising, because his other name is "man's happiness." These truly male flowers carry tremendous energy. Even a small bouquet can give the owner not only a smile, but also add self-confidence. 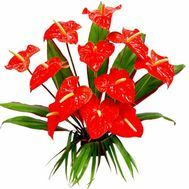 Therefore, if you want to wish success in business, to restore the fighting spirit, choose the anthurium. You can buy it in our store in any form and variation. 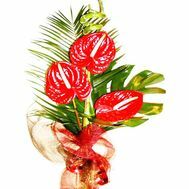 Anthurium perfectly suits as the main flower in a bouquet for a beloved man, whom you can please on February 14. Just such a bouquet can be purchased for the boss, emphasizing his solidity and status for the anniversary. In addition, we can add to the order anything else: a cake, balloons, a soft toy or a free postcard with your wishes. 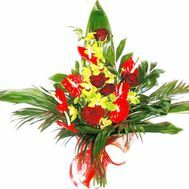 Order flowers with delivery in our store, and we our couriers will deliver flowers on the exact day and time. Exact delivery is something that you definitely will like! We always have reasonable prices, as well as many stocks and discounts, which you can not pass! Still in doubt? Read the reviews of our customers in the relevant section, and our managers will be able to answer any question interesting you. Ordering from us, you can be sure that we will be able to deliver the best quality bouquet in the shortest possible time.